We have just started homeschooling our boys this year, and I have been looking for some interesting and engaging ways to encourage my boys to learn. There are a number of ways to teach your children at home, but in recent years unit studies have become very popular. You can find many unit studies to choose from all over the internet. What is a unit study? A unit study is a creative way to combine history, social studies, language arts, math, logic, photography, drama, geography, and science all into one learning activity. Your child has fun experiencing the chosen subject from many different angles, with many hands-on projects. Studies have shown that children learn and retain more when they are actively participating in the project they are working on. This particular unit study is about medieval England. 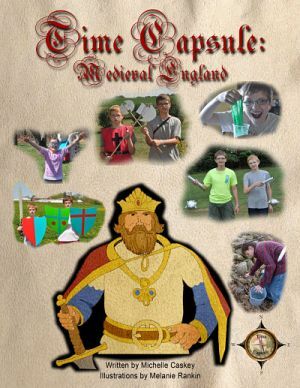 This unit study is called Time Capsule: Medieval England by Michelle Caskey. There are daily lessons to keep your children engaged and learning for 12 weeks (300 activities in all)! For each day you also have a variety of activity options to choose from to suit your child’s interest and needs. The unit study also includes a supplies list and suggested reading list. Your child will get to create and wear peasant clothing, listen to Old English, go on a field trip to a local farm, learn to whittle, make a water clock, design their own castle, make a medieval battle axe, and much more. While these activities would be fun for boys OR girls, they are especially suited to active boys. Not only will they be reading and writing, but doing lots of fun physical activities too. If you are looking for a fun interesting unit study, then I really recommend this one. I know that my boys are going to love it and I can’t wait to dive in. 1 Comment on "Review: Time Capsule – Medieval England Unit Study"
and dealing with Parkinson’s Disease. which I hate, and am trying to seek God’s will in this. I love your site and learn from it each week.